One of the best-known American artists, he was the most popular illustrator and painter of the first half of the 20th century, the Golden Age of illustration. Norman Rockwell, who succeeded him in that role in the 1940’s, called Parrish “one of my gods.” Parrish’s father was a painter and etcher, encouraging his son’s precocious talent. After graduating from the Pennsylvania Academy of Fine Arts in 1894, he began a career that made him wealthy and famous and influential for 50 years. A painstaking craftsman who took a keen interest in the developing printing technologies of the time, Parrish was an innovator both in adapting book and magazine illustration techniques and in business practices that made him a very wealthy man for the time. His superb drawing skills and patience in making his trademark glazed oil paintings on paper, requiring prolonged time at the easel and careful attention to detail, give his original works a luminosity and three-dimensional quality impossible to replicate. 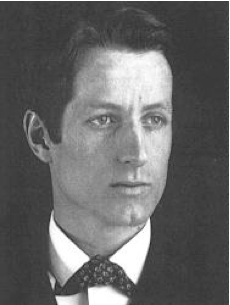 Although he worked from photographs, often using himself as a model for the subjects of his pictures, he also built detailed, sophisticated sets and prided himself on being a competent machinist with a professional workshop. All of these qualities worked at the service of an imagination filled with delight and compassion for fantastic creatures and whimsical worlds. Around 1930, Parrish gave up all commercial work and spent the rest of his life painting landscapes, many of which Brown and Bigelow used for their yearly calendars. His “Daybreak” (1922) was the 20th century’s most popular and reproduced art print. He lived the life of the handsome, popular, and successful artist that, in itself, set the standard for the American ideal of what that should be. 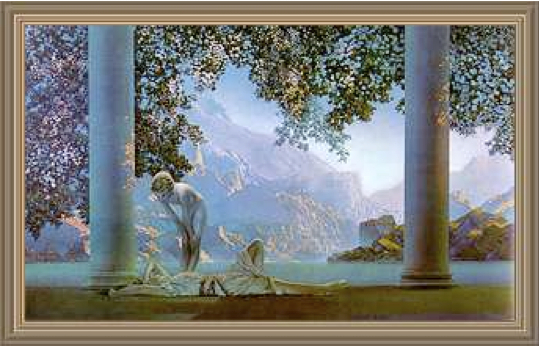 His work has gone through several revivals of critical interest in the years since his death, and many Americans spontaneously think of Maxfield Parrish as their favorite American artist.